Creamy One Pot Pasta Dinner Idea- Easy and Inexpensive! I have fallen in love with one pot pasta dinners. They are so EASY, generally inexpensive, and usually please the entire family! I found this recipe HERE on the Pampered Chef website. I loved the ease of it but wanted to make a “cheaper” version with items I already had on hand-so I made a few tweaks! I am so pleased with the result, I had to share! At the bottom of this post you can find an easy to copy and print recipe card but for now I want to show you some step by step instructions! In a large pot saute your fresh garlic in a little bit of butter. (If you don’t have fresh garlic on hand skip this part and just sprinkle some garlic salt into your chicken broth in the next step). After you have sauteed your garlic, add 6 cups of chicken broth to your pot and bring to a boil. 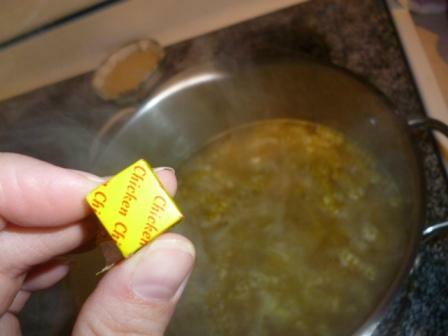 I used to buy canned chicken broth but it was very expensive, so I switched to the bullion cubes. They are inexpensive and so easy to use! Bring your chicken broth to a boil. Once your broth is boiling add your lb of pasta. 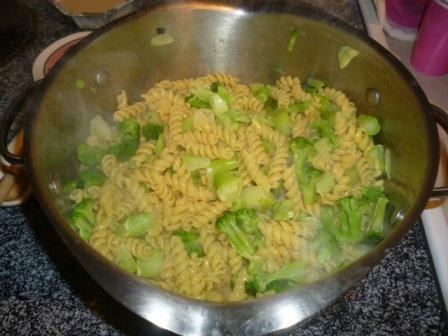 I used Rotini because that is what I had on hand. Boil your pasta for about 8-9 minutes until it is mostly tender. Do this over medium heat to reduce the amount of liquid loss. If your pasta absorbs too much of the chicken broth add a cup or 2 of water or chicken broth to make sure your pasta doesn’t dry out. After your pasta is pretty tender (not all the way done) add a bag of frozen broccoli. It doesn’t really matter if it is a 10 ounce bag or a 16 ounce bag, I added a 16 ounce bag and figured, the extra 6 ounces would help extend this meal for lots of left overs! 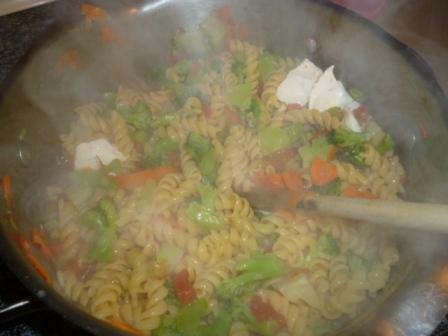 While the broccoli is cooking with the pasta peel 2 carrots into the pot. (I added a little bit of water here after I took this picture because I didn’t want my noodles to dry out and burn–but I was boiling on high-so if you do medium you won’t lose as much.) Why am I adding carrots? WHY not! I don’t really like cooked carrots, but it give this dish a beautiful color and they taste like chicken broth once they are cooked in this meal! Since we are adding veggies I threw in some diced tomatoes. 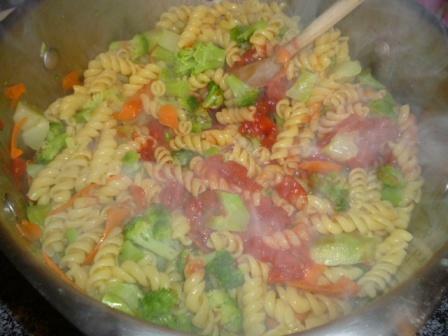 Fresh would be great too or sun dried–but canned and diced is what I had on hand–so that is what went in. Cut your 4 ounces of cream cheese into small squares so they will melt faster and stir those into the pot too. This turns the little bit of liquid left into an incredibly tasty cream sauce! By the time the cream cheese melts the broccoli and pasta are done and you are ready to serve up this beautiful, easy, less than 20 minute, one pot pasta dinner! My absolute favorite part about it, is it makes a TON! We’ve got a pound of broccoli, a pound of pasta, and other veggies in this dish that makes enough to feed my family of 5 dinner 3 times and 2 lunches! I can’t even break down how CHEAP that is! My kids absolutely love this pasta. They ask for not just seconds but thirds every time we have it and are still excited when we eat it for left overs the next day! My husband suggested that I add some chicken to it or sausage, which would make for a heartier meal…but we all still like it even if it doesn’t have any meat! Saute chopped garlic in a little oil/butter. Add chicken broth. Bring chicken to a boil in large pot. Reduce heat to medium. Add 1 lb of pasta. Boil for 8-9 minutes or until slightly tender. Add 1 bag of frozen broccoli. Add more water or chicken broth if needed. 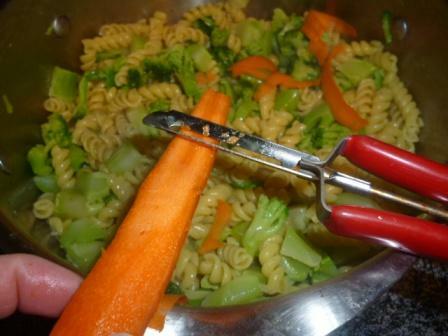 While the broccoli cooks peel in 2 carrots. Add 1 can of diced tomatoes (your flavor choice). Cut 4 ounces of cream cheese into smaller cubes and add to pot as well. Stir until melted. Check tenderness of broccoli. Ready to serve when broccoli and noodles have reached desired tenderness. Let me know if you make this and if your family loves it as much as mine does! This looks like a great, tasty recipe! I’m always looking for ways to add more veggies into my daily meals. Wow, I have to agree with you, I love these kinds of dinners as well! This looks so delicious I can’t wait to make it this week! Thank you for sharing! This is such a great idea! One pot meals are the best! 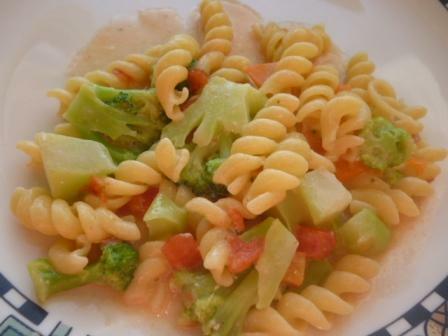 Great idea to cook the pasta in chicken broth for extra flavor and nutrition, and to cook the veggies right in there with the pasta. This is going on my make-soon list. Thanks!